MMS DECEMBER 2018 66 mmsonline.com WORKHOLDING Fixture Design | Contour Precision Milling & Machining 440-365-7333 | contourprecisionmilling.com Although typically a value-added, back-end service, assembly happens before machining is complete on this job. Assembling components before finish-machining both ensures that the two large bores on one compo- nent precisely align with those on the other. This is more efficient than machining separately, which would require maintaining higher precision on the smaller, connecting dowel holes. The part is mounted on an adjustable, inner-diameter (ID) clamp from Mitee-Bite. when foundries remove this material themselves, compounding the natural material inconsistencies of the casting or forging process. On-the-f loor experimenting and troubleshooting often are the only ways forward. HOLD ON LOOSELY (BUT DON'T LET GO). Fixtures must strike a balance between gripping parts securely enough for machining and preventing part warpage and "spring-back" upon release. "Usually, holding looser will give you the better-quality part, although you might have to adjust the machin- ing operation to do that," Mr. Kerecz says. "This enables you to machine the part the same way you inspect it when it's not in the fixture." 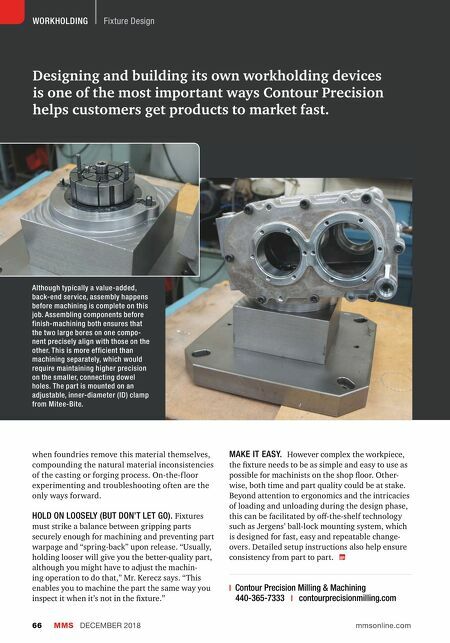 Designing and building its own workholding devices is one of the most important ways Contour Precision helps customers get products to market fast. MAKE IT EASY. 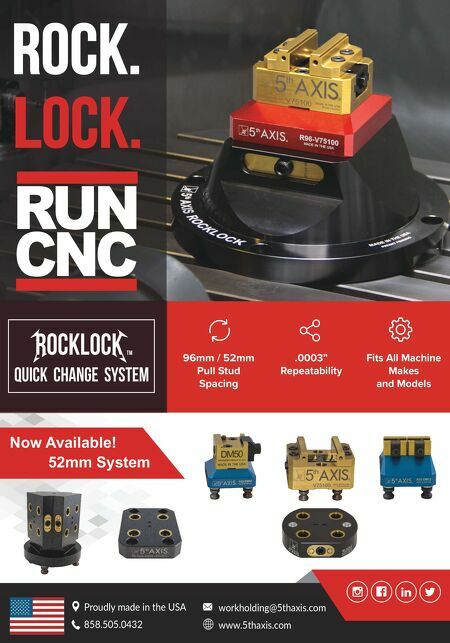 However complex the workpiece, the fixture needs to be as simple and easy to use as possible for machinists on the shop floor. Other- wise, both time and part quality could be at stake. Beyond attention to ergonomics and the intricacies of loading and unloading during the design phase, this can be facilitated by off-the-shelf technology such as Jergens' ball-lock mounting system, which is designed for fast, easy and repeatable change- overs. Detailed setup instructions also help ensure consistency from part to part.